Have you ever been assigned a major presentation at a moment’s notice? If you have, you’ve most likely experienced the usual feelings of stress and anxiety. This is normal, and everyone gets this feeling. It feels like you’ve got plenty on your plate, and a scary presentation won’t be making things better. Presenting in front of a large audience can be daunting, and making a presentation in the first place is equally frightening. However, instead of shying away from your fears, overcome them one at a time! Finding success in presenting requires a different path for each person, but there are general rules that all should follow. Oftentimes, presenters find the most trouble in their lack of a clear goal. However, every presentation needs a goal. If you are presenting to prospective investors, your presentation’s goal should be its ability to demonstrate a company’s potential. If you find yourself giving a company-wide update, then your presentation should do just that: update your coworkers. This is the first step to beginning a presentation. A presentation’s goal is like its thesis, and should be kept in mind throughout the duration of the creation of your presentation. After creating a goal for your presentation, begin to organize the jumbled up pile of thoughts you have. What do you want your audience to learn? How do you want to provide them with the information they want to learn? What presenting methods will you employ to do this successfully? These are all good questions to consider when beginning to form a presentation, and it’s important to tease out the answers. It might sound cliche, but there really is no other way around it. 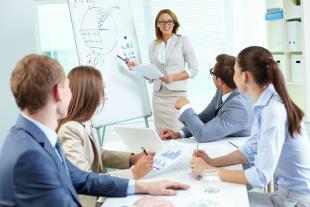 Practicing your presentation really can increase your success exponentially. Not to mention, your confidence will increase as well, getting rid of some of the initial stress you experienced when getting assigned the presentation in the first place. Practicing for a presentation allows you to find errors or problem points in your presentation that you may not have found by just going over it on your own. Everyone knows that presentations are scary. But few can conquer them with the necessary skills. Along with following these steps, view our presentation skills course and you’ll find yourself delivering presentations with precision, poise, and perfection!